XAW044801 ISLE OF MAN (1952). 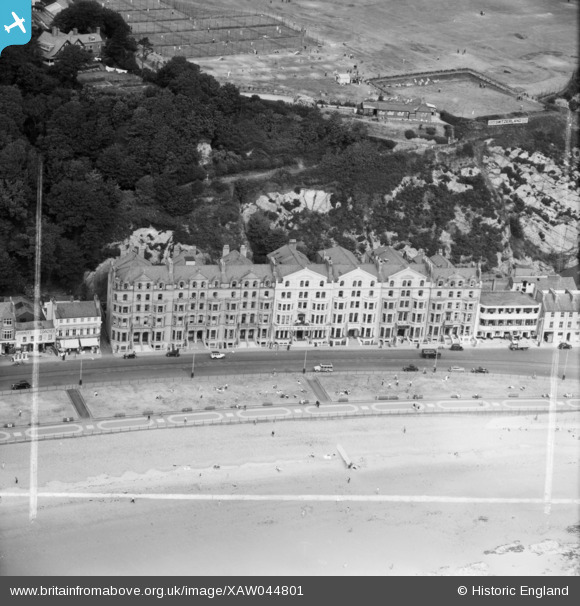 "Metropole" Hotel Ltd., Queen's Promenade, Douglas, Isle of Man, Isle of Man, 1952. Oblique aerial photograph taken facing North. This image was marked by Aerofilms Ltd for photo editing. Title [XAW044801] "Metropole" Hotel Ltd., Queen's Promenade, Douglas, Isle of Man, Isle of Man, 1952. Oblique aerial photograph taken facing North. This image was marked by Aerofilms Ltd for photo editing. Shimmins Garage 14-19 Queens Promenade, after the numbers of two TT winners in the twenties who garaged there one year. That became the official postal address. They were the agent for Triumph and had brand new Heralds, Spitfires, Vitesses and 2000's, the Herald based fibre glass car, the Bond Equipe and also new Reliant Schimitars. Sold to Tours (IOM) Ltd November 1972. Hi Billy,Your example is actually an Atkinson. Thanks again sir...a little typo by myself, it is an Atkinson as you say. Unfortunately the site won't allow me to edit it.